Take some real enjoyment from this sweet little treat! No calories, lot's of fiber and a visually delightful cup cake. The cup cake is made from the bottom and upwards. It begins with making a circle as the base, 1 round of working into the back loops to raise the cake, several rounds to make the cake taller, 3 rounds to make the strawberry surrounds, 1 round for the dollop of cream, then a few more rounds to close the top of the cake. Chocolate brown yarn is used for the cup cake, red and green for the strawberry rounds and white is used for the dollop of cream and the lid of the cake. Please note that using thinner or thicker yarn and hook size will change the size of your cupcake. Make it big or go small. These materials will give you a medium size. Cluster st = unfinished hdc = yarn over hook, insert hook into st and pull out a loop. This technique will be used 1 time in each of the next 5 st's to close the strawberry and make it pop out. Time to make: for your first one, about 2 hours, the more you make the quicker they become. Repeat row 2 until cake measures approx 1 and a half inches high, this will be about 8 to 10 rounds, break off choc brown yarn and begin next row with green. NOTE for round 2: always carry the yarn that is not in use. Round 7. ch 1 *work 2 sc together* repeat from *to* to end, sl st to join (6 sc), break off yarn leaving a tail to weave the remaining st's closed, sew in and hide ending tail. Congratulations, you have now finished your cup cake. To make your cupcake look extra delicious you can add a strawberry to the top, a heart applique, an extra dollop of cream or create something you really fancy. For the heart applique, I used my super quick, 2 round free crochet heart pattern that you can find here. 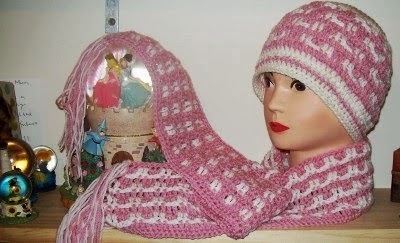 For the strawberry, I watched this video tutorial, or you can do a search for a written, free crochet strawberry pattern. I also watched this video tutorial on how to make the strawberry stitch pattern that gave me the idea to place the strawberry field on a cup cake. I did change it a bit to suit the cupcake, but it will give you a good idea of how I made the strawberry. I was super excited about my re-purposed stuffing! I had washed and dried some old pillows, cut the corner out of the pillow cover and just reached in and pulled out perfect stuffing! I have some old cushions I plan to do this to as well. A big bag of shop bought stuffing is not cheap, so I saved $'s by doing it this way. 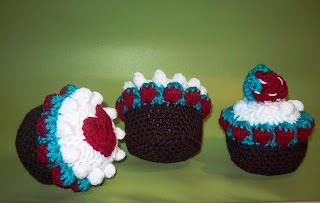 Anyhow, I hope you have enjoyed this fun and cute cupcake pattern, I've been making these and more sweets for the Mothers Day stall at my granddaughters school and I'm so happy to get a little time in for crocheting once again!